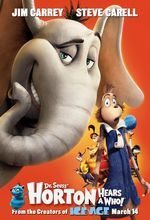 Film adaptation of a Dr. Seuss story of the same name follows an elephant's efforts to protect the existence of a colony of microscopic humanoids. Jungle-dwelling elephant Horton hears a distress call from a speck of dust floating in his vicinity one unusual day, learning shortly after rescuing said speck from oblivion with the aid of a clover that it plays host to the Whos, a whimsical colony of microscopic humanoid creatures living in their town of Whoville. Emboldened by a belief that "a person is a person, no matter how small", Horton goes about attempting to preserve Whoville's existence, doing so despite skepticism and outright hostility from his neighbors.